Mushroom Guru (Pty) Ltd. is proud to present GanodermaGOLD first product, MG-LZ8 (Mushroom Guru-Lingzhi 8) and MG-LZ8-EQ. Ganoderma lucidum, also known as Lingzhi in China and Reishi in Japan, has been used for its medicinal properties for more than 2,000 years. This extraordinary fungus develops a mushroom that is red in colour, smooth to the touch and astoundingly beautiful, yet incredibly bitter. Therefore, to be able to experience the benefits of this medicinal mushroom, you would either need to steep it in water and drink the extract as a tea, or prepare an alcohol (ethanol) extraction to make certain compounds (Ganoderic acid and triterpenoids) available for digestion. Ganoderma lucidum is also known as the ​"Mushroom of Immortality" and the "Supernatural Mushroom". GanodermaGOLD is the name of an extraordinary product range being created by us at Mushroom Guru and MG-LZ8 is the name that we have given to our concentrated extract of the Ganoderma lucidum mushroom. MG-LZ8 is the corner stone of our new range and is the extract that will be used for all our products. The name "LZ8" (Ling Zhi-8) was originally given to an immunomodulatory protein, isolated from Ganoderma lucidum. MG-LZ8-EQ is the name given to our horse formulation. We have just received some of our results from a clinical trial done by ​, PhD Professor Vaclav Vetvicka at the University of Louisville, Department of Pathology. Not only has Mushroom Guru perfected this growing method, but also developed South Africa's first pure Reishi double extract capsule product. The extracted materials are blended back into the exact same ratio as they were extracted. Each capsule contains 15mg of Reishi double extract (MG-LZ8), which is 12 times stronger than outdoor grown Reishi and thus provides the equivalent of 5400mg of Reishi powder per capsule. This product is non-toxic and free of alcohol, unlike combination tinctures. What is the difference between Reishi powder and Reishi extract? The most important factor of any medicine is related to the bio-availability of the compounds inside the medicine. There is a compound in the mushroom cell wall, called Chitin, which our digestive system struggles to digest. When you consume a mushroom powder (whole dried mushroom powder), the Chitin may leave you with an uneasy feeling in your stomach. In some cases, Chitin causes severe nausea and headaches in people who consume raw mushrooms. When the water soluble compounds are extracted using hot water, the nutrient/medicinal value increases dramatically, as seen in the COA document below. 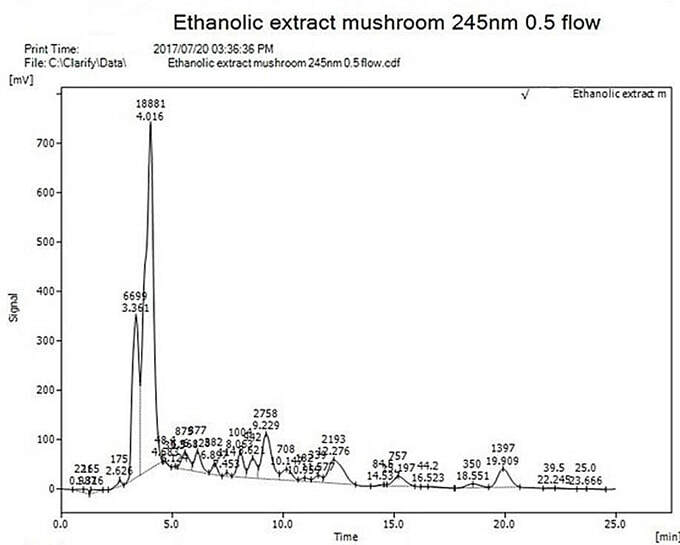 When extracting the solvent-based compounds from the Reishi mushroom using ethanol, the values increase 29 fold. Our new Reishi Double Extract combines both the water and ethanol extract, thus giving you a 100% bio-available product in its purest form. ​Reishi mushroom powder is made from dried Reishi that is finely ground. It is extremely difficult to grind Reishi into a powder, so almost all fine Reishi powder is imported from China. After testing imported Reishi powder, we have found that there is very little to no active ingredients in the powder, leading us to believe that the actives have been extracted for other products for the pharmaceutical companies and the bio-mass is ground and sold to unsuspecting clients as "Ground Reishi Powder". See the HPLC graphs below. Hot water extraction helps break down the Chitin in the cell wall of the mushroom so that polysaccharides/glucans and other water soluble compounds are released. Extracted compounds are far more active than dried powder. See the HPLC graphs below. Alcohol extraction allows for all the solvent based compounds to be extracted, like Ganoderic acid and around 150 triterpenoids...among others. Alcohol extraction increases the potency by 29 fold. See the HPLC graphs below. In conclusion...extracted compounds are far more effective than dried mushroom powder. Both polar and ethanol extractions have specific functions in the body and using both together is by far the better choice. With that said, the alcohol must be evaporated from the extraction so that no trace of alcohol is left behind, as alcohol is a registered Neuro-toxin. Our Double Extract is pure extract from the fruit body of Antler grown Reishi. It contains no alcohol and is completely water soluble and bio-available. It is the first pure Reishi mushroom Double Extract product in South Africa and soon to be proven as the most active extract in the world. By law, I may not state any claims, so you can research Ganoderma lucidum yourself and come to your own conclusion. This medicine has not been evaluated by the MCC (Medical Control Council). This medicine is not intended to diagnose, treat, cure or prevent disease. The MCC can not register this product on their database, because it is not a drug. To register a drug, you need a LD50 (Lethal Dose 50% die) toxicity report and also a single claim (drugs have only 1 claim per drug). Reishi, being all natural and medicinal with no toxicity warnings and has multiple claims, thus, our product can not be registered as a pharmaceutical drug according to their rules and regulations. A fact for which I am eternally grateful for. ​Our product has been tested, extracted and bottled in a FDA inspected laboratory under strict GMP regulations. Our data has shown that our product is: Vegan, Non-GMO, Water-soluble, Chitin Free, Organic, 100% Bio-available and Non-toxic​. The data also shows the extremely high levels of medicinal compounds found in our product, namely Beta-glucans and Ganoderic acids. Mushroom Guru has developed an in-door Reishi cultivation process that yields medicinal values higher than you will find in nature and far greater than anyone else around the globe. ​Wild (naturally grown) and Mushroom Guru's indoor cultivated samples were both tested by Verve Dynamics to provide data to verify what was once just a theory that "Antler formed" Reishi may in fact have a higher medicinal value than a wild specimen. The test results indicated that Mushroom Guru's indoor cultivated Reishi has in fact higher medicinal values than a wild specimen. When growing Reishi in a high carbon dioxide environment the stem becomes elongated, as the Reishi grows upward to find fresh air. The mushroom senses when the conditions are favourable for spore production and if so, begins to form a mushroom cap which contains millions of spores that are then released into the air. This cap is referred to as a "conk". As the stem of the mushroom begins to grow it produces Ganoderic acid and when the mushroom produces a conk, it stops producing Ganoderic acid. Ganoderic acid has been recognised as a potential drug for treatment of cancer. The longer the stem, the more potent the active compounds become. When Reishi grows in an Antler form, it creates Ganoderic acid from the base to the very tip, which is substantially more Ganoderic acid than that found in the normal, short stem of a conk. MG-LZ8 is the name given to our extract and is taken from the fruit body of the antler​ and our product contains zero (0) starch. 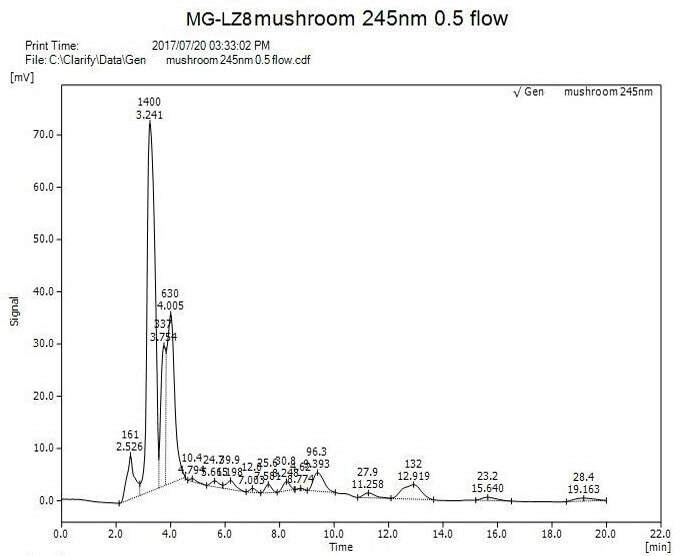 The "spikes" in the graphs below, represent the high levels of Ganoderic acid, beta(1-3)glucans and triterpenoids found in our Reishi antlers. Our proprietary growing system was developed around the production of Ganoderic acid and the development of the immunomodulatory protein LZ8. ​In the results above, you will notice that the "Whole Herb" COA has less bio-available Ganoderic acid and less beta(1-3)glucans when compared to the water and ethanol extractions. 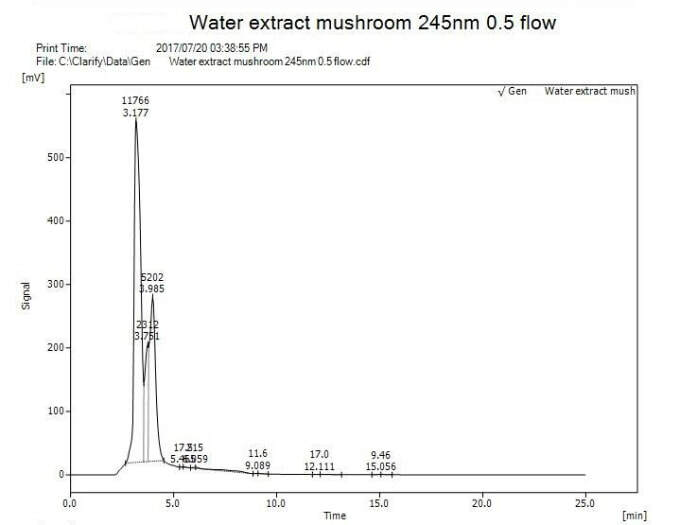 There are two main "spikes" on each graph; the one on the left in the 'water extraction' is related to the beta(1-3)glucans and the spike to the right is the Ganoderic acid. In the 'ethanol extract' graph, the Ganoderic acid is the spike to the right, beta(1-3)glucans to the left and the all the triterpenoids to the right of the two larger spikes. Verve Dynamics is a dedicated Vegan friendly manufacturer of highly purified botanical extracts and specialty ingredients sourced from around the world. Botanical extracts are usually very sensitive and unstable natural products, as a manufacturer and supplier, Verve has a great responsibility not only to you, but also to your customers, the end consumer to deliver a safe and effective product every time. Verve Dynamics manufactures customised phyto-extractions and nutraceutical ingredients in their South African facility, based in the idyllic basin of the Helderberg region east of Cape Town. The dynamic team at Verve form a vibrant and effective resource in the handling and manufacturing of nutraceutical products. All manufacturing procedures are conducted with the strictest quality control standards, meeting or exceeding manufacturing practices as mandated by international guidelines. Verve Dynamics has been FDA inspected and Cape Nature registered and certified to deal in indigenous flora. With close attention to all the stringent certification processes and with collaboration with both industry specialist and governing bodies, Verve Dynamics have established world-class standard-operating procedures which far surpass any formal requirements or legislation. A full set of all substantiating documentation is issued with each order, with full historical documentation for each botanical, process and finished product.